The swimming pool has been shaped to incorporate the trees around it.The pool area has a lot of shady, as well as sunny spots to enjoy. The area is perfect for sunbathing, reading a good book, drinking a cocktail or simply relaxing on the lounge chairs under de shade of native trees and palm trees. There is free Wi-Fi access and at the concierge desk there are some books and magazines to read. Thanks to the native trees, this area is inhabited by Green Iguanas and is often visited by groups of Howler Monkeys. The Concierge desk is located near the pool in a cozy outdoor environment. 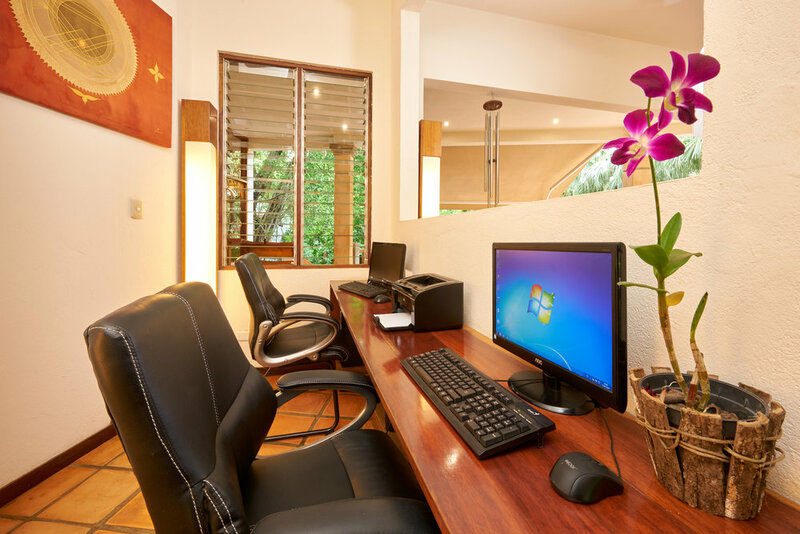 Here our concierge Rosa, who knows everything there is to know about the hotel, Tamarindo, car rentals, domestic flights, taxis and much more, will gladly help make your stay as fun, adventurous or soothing as you wish. We offer a wide variety of tours and activities of all types and provide equipment ranging from snorkel gear, kayaks and volleyball equipment to a pool table, table tennis table and board games. The exclusive Britt Shop store offers products with a local touch and tropical flavors of Costa Rica. A wide selection of souvenirs, art crafts, books, and textiles, as well as exquisite gourmet coffee blends, tropical fruits and nuts covered in chocolate or some other gourmet sweets, have been placed together in this store for those who enjoy shopping or bringing special gifts back home. An internet corner with two PCs, internet, skype and a printer are at the guests disposal 24 hours a day. Complementary wireless internet is also available in all the hotel area. Hotel Capitán Suizo has partnered with Revive Wellness Center at Langosta Beach Club to offer guests access to a state of the art, spacious, clean and air conditioned fitness center which is located just 100 meters north of the hotel. You will find the Langosta Beach Club as you take a scenic, 4-minute stroll along the beach toward Tamarindo.Guests of the hotel have full complimentary use of Revive's Gym which features cardio equipment that includes a treadmill, upright bike, Total Body Arc Trainer, elliptical trainer and a Windrigger Rowing Machine. Strength training equipment includes a dual cable machine, Smith Machine, leg extension/curl machine, power tower, adjustable benches and free weights, as well as many other fitness accessories. There are also showers and lockers provided.